Philadelphia police have released surveillance video of a smash-and-grab at the Boyds store in Center City. All of this unfolded at 4:40 Tuesday morning at the store in the 1800 block of Chestnut Street. 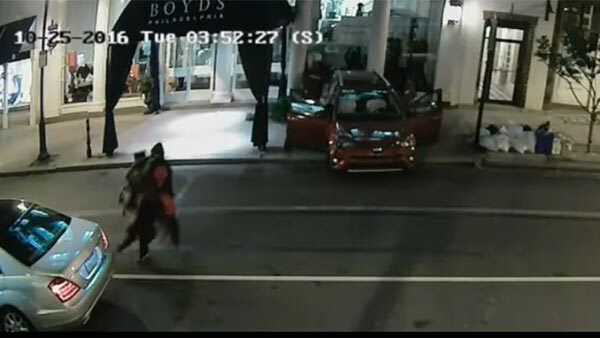 The three minute video was taken on a camera that appears to be just across the street from Boyd's Clothing Store. First you see a 2016 Toyota Rave4 drive into frame, then a 2012 Mercedes Benz, which pulls off to the side. The SUV backs into the glass window of the store. It appears after two attempts the window cracks just enough. That's when as many as seven hooded and masked suspects get out of both cars and finish the job. They shatter the window and rush in to the grab the goods. You can see one of the suspects in black hoodies running off with an armful of clothes and dumping them in the Mercedes. Philadelphia Police Lt. John Stanford explains, "We are putting out this information and the video hoping that someone can recognize either the individuals clothing description or the clothing that you see then wearing in the video of the vehicles themselves. Any tip that we can get from the public will be something that can help us in solving this crime and find out who these individuals are who are responsible for this"
We know they got away with about $45,000-worth of expensive merchandise, like men's suits and accessories. Police say the red Rav4 should have significant rear-end damage.